April's kit is so dang darling it will make you smile big! Fresh mango, orange, lemon and lime beads adorned with spring flowers make this citrus cutie a winner. Extra beads for length, earrings, etc - available for purchase. Everything you need to make this bracelet is provided in the kit, only $10, while supplies last. March's bracelet is a bright spot that is here to help you through these last dreary bits of winter! Sweet, square Kiwi Jasper is an aqua delight. Chocolate Bronzite stone brings out the honey dark spots in the Jasper. Faceted lime greens and yellows in Czech glass provide a bloom of color while you are anxiously awaiting the impending spring. Pewter spacers and and an easy pewter toggle finish this 8 inch bracelet, and a tiny four leaf clover charm brings big luck for you! February's Kit is a sweet lil' thing! Nothing says love and kindness like the soft pink of Rose Quartz. These stone rondel's are fondly matched with raspberry and pink/gold Firepolish crystal and light rose bicone crystals. Matte gold glass match the beat of the Czech gold glass hearts. A small brass heart charm dangles from the easy-to-use, secure brass toggle clasp. this bracelet can be worn with any metal color jewelry addition! Blue Jade stone will bring new year luck and pewter spacers and a large pewter toggle finish this kit. This bright green and subtle pink Czech glass bracelet is the first bracelet kit to choose from. Shining, cut silver glass, brass potato chip bent beads, and a shiny copper toggle means you can wear this bracelet with any favorite outfit! This bracelet gives some great Holiday glam! The faceted Smokey Quartz stone sparkles with every movement. The red Firepolish crystal and and dark Garnet stone provide a pop of seasonal color and the flashing snowflake charm adds whimsical merriment. This pretty starry night bracelet kit is perfect to help ease the switch to those chilly November days! Large blue and grey Saturn glass beads pair perfectly with blue and purple faceted rondel glass and small, twinkling crystal. Pyrite stone is the metallic shining star of this bracelet and comes in interesting coin and round shapes. Antique silver Firepolish glass matches the easy-to-use silver swivel lobster clasp. You can't help but love fall with this colorful accessory! All the beloved colors of autumn shine in this eight-inch bracelet kit. Matte Amethyst stone, green/blue Turquoise, ruby pink Swarovski crystals, orange pumpkin melon glass, crisp beige colored Firepolish, metals in brass and silver - all together making this abundant bracelet a staple with any seasonal outfit. With one foot into Fall, this month's bracelet has the prettiest muted pink stones in it. When paired with mustard lava and copper metal beads it can step into cooler days. Czech olive beads capped with a bronze coat are jewels of Autumn. Everything you need to make September's bracelet is included in the kit! A blend of striped African, cattle bone, and chocolate melon beads are down right earthy and splendid. Matte and gold dusted chartreuse drops and a dab of yellow crystals are perfect additions to this earthy delight! Pattern, instructions, beads, and all findings are included in this kit. Only $10 - while supplies last. July's kit is as sweet as cherry pie! Make a statement in this bright and bold combo. Large, star cut Amazonite stone shine blue, along with small Turquoise stone rounds. Poppy orange Firepolish crystal and red crystal make a firework popping contrast. Charming pewter is the metallic highlight, and a pewter toggle finishes this eight-inch bracelet. Happy, bright red glass cherry drops make this the can't-miss kit of the summer! Crispy white and navy blue are a perfect combo for summer! This month's kit includes smooth white stone and faceted glass beads paired with faceted navy and gold-wash navy nugget beads. Added touches of decorative gold metal give it class! Finally, spring has arrived! Celebrate birds chirping, warmer days, and seasonal rebirth while wearing this bright and fun bracelet. May's kit is full of decorative pewter beads and sparkling crystal. Hazy lavender Lepidolite stone is matched with bright and dark purples in faceted glass, while the sunshine yellow crystals flash over the detailed pewter flower charm and toggle clasp. Raindrops on roses, cute tassel charms, shades of mint and navy - these are a few of my favorite things! Celebrate upcoming spring showers with bright foil green glass, dark blue cut Czech, and geometric brass beads. This eight inch April bracelet comes with an easy large lobster claw clasp and a soldered brass ring with a soft, swingin' tassel decoration. The many hues of green and blue will have you dreaming of upcoming vibrant flowers. Spring has sprung with this lively and lovely bracelet design! Large glass blue flowers are eye catching and big, cut purple gold foil glass compliment. Purple and yellow glass rounds accent and Amethyst stone rounds add another depth of purple. Dream of warmer weather (coming soon!) while making this eight inch bracelet kit. Happy New Year! January's inspiration was the awesome Pantone color of the year, Ultra Violet. Shades of purple take center stage in this vibrant and happy piece. Firepolish crystal glass, Amethyst Swarovski crystals, brass bicones and heishi spacers contrast with bright greens and burgundy reds. Garnet stone with brass caps provide a semi-precious touch and a garnet Swarovski crystal dangles from the brass extender chain clasp. This sparkling bracelet makes a great gift for teachers, neighbors, friends, and especially you! Get several and have beading party. Subtle light green glass melon beads and light turquoise blue Firepolish glass make the brass and gold tones light up. A decorative easy-to-use gold toggle clasp finishes your piece and a golden heart charm dangles from the end. This November, we're thankful for the therapy of beads. In this month's bracelet, pretty Pyrite stone catches a metallic glint in large oval shapes. Garnet stone invite a dramatic dark red - also showcased in the large Czech glass bicone centerpiece. Blush melon glass beads add a touch of brightness and Firepolish crystal glass sparkle in tones of grey. Large decorative pewter beads in rounds and discs are the metal accents, along with a pewter toggle. Fall in love with this month's bracelet featuring beautiful autumn colors - Firepolish crystal glass in pumpkin, golden mustard, and a rusty red brown. Hyacinth Satin Swarovski crystals add a touch of brightness, while large faceted Smoky Quartz stone is quite the eye catcher. Sparkling gold metals finish off this October creation. It's spooky good! August's Bracelet is on FIRE! This hot number has poppy red and bright yellow Firepolish crystals with Sun Swarovski crystals. Teal faceted glass and Turquoise stone cool this design. Orange Jade stone and decorative pewter beads finish off this end of summer treat. A geometric charm dangles from the extender chain - great for various sized wrists! The softest, prettiest shades of blue Quartz stone and cut Czech glass beads are paired with bold rusty red Magnesite stone. Cute pewter tubes stamped with a little sun, and daisy spacers add texture and fun to this month's bracelet. Get everything you need to make it in our $10.00 kit! This bracelet is a citrus sensation! Summer colors are juicy sweet in this eight inch bracelet kit. Large lime quartz stone are paired with tangerine bicone glass and orange Jade faceted stone. Lemon yellow Czech glass and kiwi green faceted Czech glass compliment bright, shining cut silver beads. A swirling pewter charm dangles from a toggle clasp. May's bracelet features light pink strawberry and dark raspberry firepolish crystal beads. Shining silver tubes create a fun bangle bracelet look and a couple of spiral pewter beads add a twist. A sun charm dangles freely with a sparkling pink Swarovski crystal. 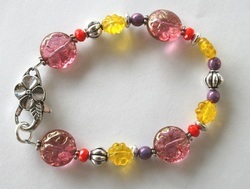 Bring some sunshine into your life with this bright bracelet - also a great gift for Mom! 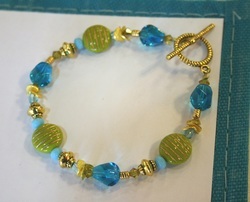 April's bracelet kit will shower you with an eye pleasing color palette in bright Turquoise blue and gold. Faceted Amethyst stone rounds are perfect for catching the sun and beige sand glass match with the Turquoise blue firepolish crystal and Czech glass. Cut purple Hematite stone and decorative gold pewter beads with a matching toggle clasp finish off this 8 inch kit. A gold chain is added to make this a fun double strand bracelet! Swing into spring this month with a color pallete of lucky, lovely green! Semi-precious stone in green Adventurine and lime Magnesite are paired with textured African sandcasted glass in a seasonal spring green-blue. Translucent green crystal and decorative pewter beads shine next to a dangling four leaf clover which hangs from a pewter toggle. This charmed bracelet kit is yours for only $10. Everything you need is in the kit! This sweet lil' number features geometric fun with crystal clear Czech glass half-circles. A splash of pink is in the round Rose Quartz and the Turquoise is a welcome brightness. Fall in love with the bold, faceted translucent red glass with turquoise colored flecks. A pewter heart charm and secure toggle clasp end this 8 inch bracelet. Get all the materials needed, including instructions, to make this pretty piece - $10! Red faceted tiger eye stone is combined with a mix of ornate brass, and bronze and brass spacers. Copper bicone are vibrant metallic beads while transparent Czech glass rondel beads catch the light. A copper flower dangle hangs from a gold pewter toggle. December Bracelet of the Month - Two choices! December's Bracelet is a winter wonder! Aurora borealis colors are reflected in the icy Moonstone and the snow white Jade stone is a crisp seasonal accent. Bright metallic blue Hematite stone is a lovely pop of color and faceted Onyx stone and gunmetal Firepolish provides even more sparkle. A charm of pewter and hematite dangles from a decorative pewter clasp. Get everything you need to make this go-with-everything bracelet...only $10! December has another bracelet kit choice! Specially offered for the season is a beautiful Holiday Bracelet Kit. Smooth, clear Cystal stone is surrounded by faceted Labradorite beads and Citrine stone. Cut gold metal sparkles next to berry red Firepolish crystals. A large link gold chain makes this two-strand bracelet pleasing and lovely! A matching large gold toggle ties together this happy Holiday bracelet. Get everything you need in this kit to make the Holiday Bracelet - $20. Garnet stones in a beautiful red bordeaux paired with metallic gold, silver and brass hematite stone are perfect for Fall and this month's bracelet kit. A lovely etched pewter bead dangles from the sturdy toggle. Only $10...while supply lasts. October's bracelet is spooky good! This 8-inch beauty has stones galore in sparkling Pyrite, bright pink Jade, and metallic Hematite. Fall colors accent in mustard and dusty pink Czech glass. A length of beaded brass chain doubles the fun! This easy-to-make bracelet kit has everything you need, including pattern, instructions, beads, chain, wire, crimps, and a clasp. All you need is a flat note pliers! Only $10....while supplies last! Fall into the new season with this month's bracelet kit! This eight inch bracelet features gold pumpkin shaped beads, faceted red and brown glass, and African white glass. Put some sunshine into these crisp days with small and medium pewter beads that showcase a decorative sun design. A glass black arrow hangs as a dangle from the silver pewter toggle clasp. This months bracelet is double the fun with a double strand 8 inch interesting design! String beads of purple stone hematite, brass, Swarovski crystals, and Czech glass. Add a bright green glass beaded chain piece to your brass clap and say hello to your new favorite bracelet! This light and bright bracelet is a great beach summer go-to! Bright metallic glass pearls match the metallic blue Hematite stone. Green Jade and a pop of orange glass add more splashes of color. Pewter silver, silver clasp, and a silver bird charm finish off this 8inch bracelet design. Get all beads needed, pattern, instructions, wire, clasp, and crimps - all for only $10! As always, while supplies last! Buzz in soon! 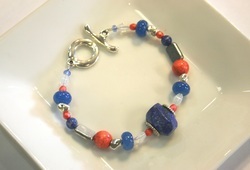 Large and lovely Lapis cut stone is the focal star of this bright bracelet! 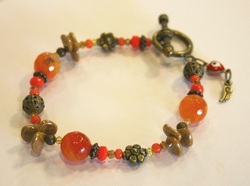 Poppy orange in firepolish crystal and magnesite stone contrast the blue agate rondell beads and moonstone glass. Pewter color in glass and metal nugget beads and a toggle complete this eight inch bracelet. A perfect start to the beginning of summer! Get all beads needed, pattern, instructions, wire, crimps, and a clasp - all for only $10. Mom will be pretty in pink this month wearing May's very feminine bracelet. It exudes sweetness! Raspberry pink, soft pink (Pink Quartz is Pantone's 2016 Spring color) and a touch of muted yellow are so pretty together. Smoky quartz colored beads add some grown-upness to an otherwise June Cleaver look. This color combination looks great with silver or gold so we're offering kits with either sparkly silver or gold potato chip metal spacers and clasps. Mom's choice! Get everything you need to make this eight-inch beauty for only $10.00. Hurry, this one will go fast! swivel lobster clasp. Receive all beads, instruction, pattern, wire, and clasp - all for only $10! Hop into Beadhive to get this bloomin' beauty! This kit contains all the beads you need to make this eight inch bracelet - plus instructions, wire, crimps, and a pewter gold toggle clasp. Bright green jade stone, Peridot Swarovski crystals, and gold and green glass accompany bright gold flower beads and spacers. Light blue Amazonite stone and antique brass beads make this mixed metal piece a great Spring accessory. Only $10! February's kit incorporates several of the pretty new Spring 2016 Pantone colors. Sparkly Swarovski crystals in Pantone's Rose Quartz and Peach Echo are in contrast with rustic African glass in Peach Echo, and hand-made African metal beads. Czech glass in Iced Coffee, pewter heishi spacers, and a bold toggle finish it nicely. Buzz in soon, this bracelet is already going fast! Everything you need to make this bracelet is only $10. wing charm. Happy New Year! Buzz in for this December Bracelet Kit #3! This one is sparkling with pine green crystals, gunmetal rounds, and light green matte Firepolish. Clear Swarovski crystals and decorative pewter beads accent, and large silver tubes makes this "bangle" bracelet a great accessory! Give as a gift, get a few for a bead party, or make it for yourself for some Holiday Bling! This month choose between two beautiful holiday kits. Both have plenty of sparkle with Swarovski crystals and glimmery "dusted" metal beads. Rich red Czech beads accent the gold and silver perfectly. Wear them throughout the holiday season or anytime of year. Each kit includes everything needed to make an eight-inch bracelet and quite a deal at $10. November is the month to give thanks! Bright mustard yellow crystals and dusty metallic pink firepolish pair beautifully with shiny Pyrite semi-precious stone. This bracelet is a fun mixed metal piece, with decorative pewter and black gunmetal beads. 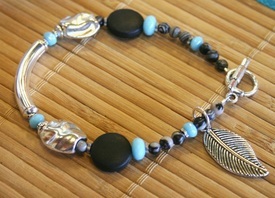 Grey African glass rings and a silver pewter toggle and a feather dangle finish this 8 inch bracelet. October's bracelet is in shades of dark and light greens with Howlite stone tubes, Jade, slivers of shell, and Swarovski crystals. African copper beads with a copper toggle and bell charm finish off this crisp and cool 8 inch bracelet. Make this kit after apple picking for a perfect accessory! $10 gets you the kit which has everything you need to complete this project. The days are shorter but there's still plenty of sunshine to be had with this month's bracelet. Sunset orange stones and glass beads are surrounded by Swarovski crystals and beads in shades of Fall. A cute evil eye to watch over you and a fanciful wing dangle from a sturdy brass toggle. The kit includes everything you need to make this 8-inch bracelet. The August Bracelet is lavender blue cathedral and rondel firepolish beads, and lilac glass pearls - so pretty in this month's bracelet kit. Gold etched metal beads and mottled tan glass keep the pastels from being too sugary sweet. July is full of BBQ's, art fairs, beaches, and tons of Summer fun! Buzz by Beadhive to pick up July's Kit for a fun and pretty bracelet to wear during all your warm weather activities. This 8 inch bracelet has turquoise galore - the best Summer color! Turquoise glass large bicones, flowers, and discs are accompanied by multicolored cream beads, bronze accents, and mustard yellow glass rounds. The silver is all pewter, featuring smooth discs, small flowers, and a toggle. It's the perfect casual go-to bracelet for your summer wardrobe. Jasper and matte black stone beads are complemented with faceted robins-egg blue glass. Pewter pebbles and spacer beads surround the metal tube focal piece that sits on your wrist like a bangle. Enjoy the movement of a summer leaf as it slides along your bracelet or dangles from the clasp. The new kit has all sorts of cheerful going on! Yellow glass flowers and large pink dimpled disks are strung together with poppy and plum colored beads. We finished it off with a giant flowered lobster clasp. It's like a breath of Fresh air! This month's kit with crisp shades of blue and green Czech glass and Swarovski crystals looks good enough to drink! Touches of decorative and frosted gold add a sunny reflection and the lined pewter gold toggle finishes off this Spring accessory. Spring into March with sunny yellow wooden beads and bright yellow firepolish glass. Lavender crystals and bright red seed beads add an extra pop of color and the Aquamarine Swarovski crystals pay tribute to the March birthstone! Decorative pewter beads and a really fun flower toggle finish off this great Spring accessory. This $10 kit contains all beads needed, instructions, pattern, wire and clasp. February 2015's bracelet kit is so pretty! It's a beautiful Valentine's Day gift for your mom, sister, friend, or you. 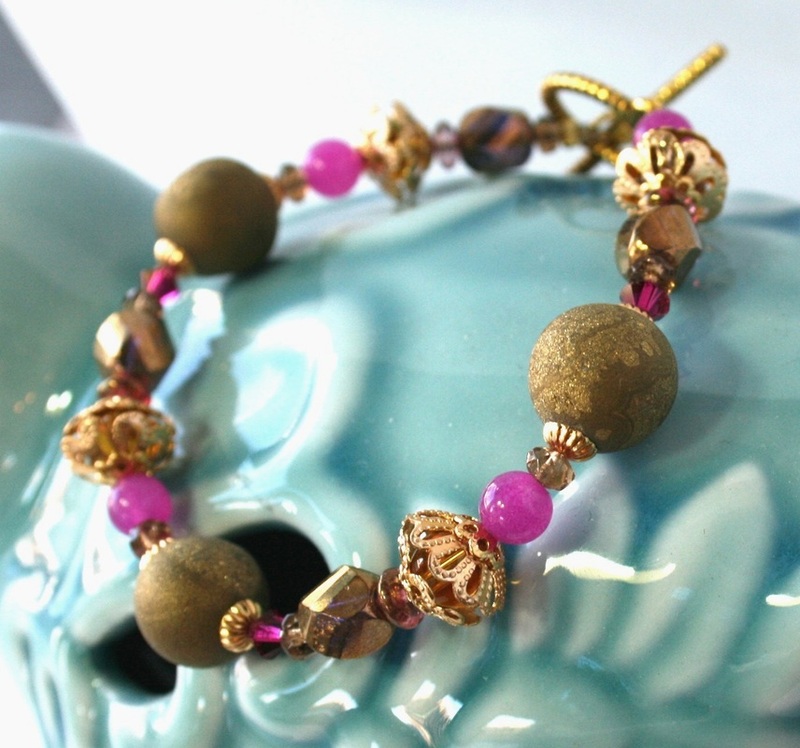 The bronze glass and druzy stone beads are gorgeous when paired with fushia-dyed jade and brilliant Swarovski crystals. The addition of filigree bead caps make this bracelet scream romance! The first December kit is sold out! That kit was so fun, we made a second one in its image. Large metallic grey crystals, clear glass crystals, and jet black Swarovski Crystals make this bracelet have some seriously fun sparkle. Silver tube beads are still included to give this bracelet a cuff-like look. Decorative pewter beads and matte dark red crystals and seed beads finish out this holiday accessory. Give this kit as a gift or get family and friends together for a bracelet kit beading party! $10 includes pattern, beads, wire, crimps, toggle, and everything you need to make this 8 inch bracelet. November's bracelet kit has a beautiful palette that's just right for that Fall to Winter transition. 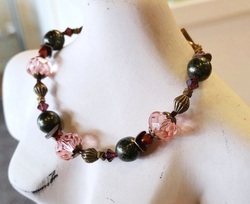 Large antique rose faceted beads and burgundy Swarovski crystals give it pizzazz. We added complementary khaki-colored glass and brass metal beads to soften the bling, making it perfect for cozy sweater weather. Everything you need to make this eight-inch bracelet is included in the kit! $10. Ornate pewter discs and creamy red glass beads look fantastic together! Metallic purple glass, African white heart seed beads, and more fun pewter beads add to this bracelet with two pewter feathers dangling from the toggle. Light brown Fall colored Swarovski crystals add a glimmer to this funky bracelet that will make you want to join a gypsy caravan when you put it on! $10 gets you all the beads and charms needed - including the pattern, instructions, wire, and clasp. This bracelet features dark brown burnt Jade and bright yellow Jade. There are fun decorated copper and cut copper beads. Bright splashes of turquoise glass and crystal and orange African white heart glass are great for this end of Summer/beginning of Fall accessory! This kit contains everything you need to make this bracelet. $10! The August Bracelet Kit is here! Dark purple River Stone are combined with decorative brass beads for this end-of-Summer accessory. There is bright red/gold glass, sparkly Swarovski crystals, shimmering lavender glass, and sunny yellow African white heart glass. A circle charm stamped with a star dangles from the brass toggle. This kit has all the beads featured, wire, crimps, and the pattern with instructions. Only $10. Get yours while supplies last! July's second kit has the same bright and fun color palette as the first kit, but has gold flowers to accent! Complete with a really fun gold teapot toggle - it's still $10 and everything you need to make this bracelet, including the pattern, is included! Dip into a vibrant capri blue and yellow bracelet this Summer. Cute gunmetal posies sprout along side mellower shades of green and blue glass beads making July's bracelet kit a perfect warm weather cutie. And high-five the friendly, wave-surfing starfish as you wiggle your toes in soft beach sand. This bracelet is packed with fun! Soft brown horn stick beads are paired with black and brown bone beads. Bright blue glass in different shades accent this perfect Summer accessory! $10 - all materials included. Our first bracelet kit was so popular it sold out! Thanks! We made another one highlighting lovely bits of the last bracelet, but with new blue Amazonite stone and mother of pearl beads. Still $10. Get yours today! 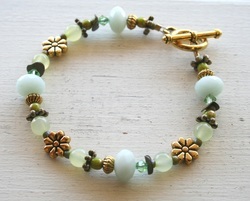 This fresh Spring bracelet features gold flowers and heishi* spacers. African white heart beads in sky blue, green glass sputnik beads, and pink glass disks complete this long-awaited Spring palette. We've added a twinkling star charm for you to wish upon! March's bracelet of the month is full of colorful beads that will warm you up and get you ready to exit this frigid winter. Bright African glass, sparkly Swarovski crystal, lovely glass, and jazzy metal are combined with a pewter frog charm to make up this 8-inch bracelet. This kit contains all needed beads, pattern, instructions, wire, crimps, and a clasp with charm. Buzz in while they last. bracelet is gorgeous and perfect for Valentine's Day! Treat yourself or impress your sweetie with a lustrous freshwater pearl, deep garnet stone, and brilliant Swarosvski crystal bracelet. This kit comes with wire, pattern, instructions, crimps, clasp, and all beads needed to make this eight inch bracelet. All you need at home is a flat nose pliers! Great for gifts. $10. A kit made with beautiful green crystals and pearls mixed with black and purple glass, it is sprinkled with silver heishi and silver grey rondells. All these wintery colors make this new Bracelet of the Month ideal for any January wardrobe. Embrace winter! Perfect for our December weather, the new Bracelet of the Month Kit in silver pewter and crystal clear beads reminds us of the clear, cold, and icy, (but beautiful) days ahead. Drops of blue and black diamond crystals complete our winter wonderland-ish bracelet. This kit contains everything you need to make this eight-inch bracelet. Smokey gray and gold faceted glass beads are beautifully enhanced with Chinese crystals that capture and reflect light. Nicely detailed gold plated tubes and rounds add a classy and elegant touch to our November Bracelet of the Month Kit. This kit contains everything you need to make this eight-inch bracelet. This fun Fall bracelet is alive with crisp colors for the season! 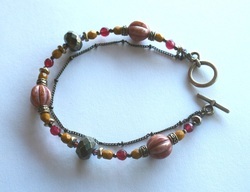 African yellow sandstone and red Czech glass are paired with shiny pewter beads in this eight inch kit. A pewter toggle and a pewter bee finish off your bracelet. Buzz in and get yours today! This kit contains instructions, pattern, beads, wire, and crimps. This pretty little number was inspired by the Fall Pantone color palette. Colors like Turbulence, Lichen Green, Acai, Koi, and Vivacious blend together beautifully. A falling leaf dangles from the September bracelet as a welcome to the coming season. The kit contains everything you need to make an awesome eight-inch bracelet! $10. Shades of bright pink quartz and sparkling turquoise crystals make for a fun and playful contrast. Deep bronze glass beads and brass bead caps bring the sweetness down a notch. We've added amber-colored and matte turquoise glass beads with cute little Thai-style pewter beads and finished it off with a really cool textured toggle. It's all packaged up with instructions, pattern, wire, and crimps for $10! Go earthy with a bracelet of natural African cattle bone, Bamboo Jasper and Yellow Jade stones. The large glass beads with the look of stone and petite blue firepolish beads are all wrapped up and ready for a walk in the park! Kits include everything needed to make the eight-inch bracelet. $10. Click the picture to see a larger view! The June bracelet offers the happy pop of color you need! African white heart beads in the prettiest color are alive and hip when paired with spring green and teal glass. Throw in clear recycled glass from Ghana, and faceted silver metal beads that reflect light for a perfect eight-inch bracelet. This kit has all the supplies, instructions, and pattern needed to make the June bracelet. $10. Emerald is the color of the year! So we gave our bracelet a Springy kick with emerald and greens in warmer tones. Chrysoprase stone is Pantone's "Tender Shoots" color and Emerald African disks look pretty great mixed with the beautifully polished black glass beads. Made with the same lovely color pallet as the BOM #1, this bracelet features the same design and dangle as our first popular sold out kit. Get yours today for only $10! Kit includes everything you need to make this bracelet. Headed for a warmer climate? Don't forget to pack your motivational rumba-dance bracelet! The tropic colors will keep you up and moving all night long. $10.00 ~ Kit includes everything you need to make this eight-inch bracelet. You'll fall in love with this month's bracelet kit. Pretty plum, African glass, natural turquoise stones, spring green glass, and a touch of crystal bling will make your heart sprout wings! Lots of fun and a little funky is what the January bracelet kit is all about. An OM symbol charm and howlite turquoise stone jangle and slide across a textured brass tube. Montana blue and a variety of turquoise colored beads are easy on the eyes and lend themselves to all season wear. $10.00 ~ includes all beads, pattern, wire, clasp, and crimps. This cutie is made with real amethyst stone and freshwater pearls. Fun metal rose beads and pewter spacers are sprinkled in and green swarovski crystals add a pop of contrast color. Dangling off the pewter toggle is a wing and a pearl dangle. This bracelet is easy to make and would be a fabulous stocking stuffer or great holiday accessory. Kit includes all beads, dangle, wire, crimps, and pattern. Black, terracotta, and brass colored beads mesh together with ease, and are perfect colors for your fall and winter wardrobe. A drop of beads hang from a bali-style bail, adding movement and fun. The regal cobalt blue, opaque black, and gun-metal gray color combination is fit for royalty! The fleur-de-lis charm, a symbol centuries old, lends itself to the bracelet's ancient medieval flair. Fall is in the air! The new bracelet kit combines the earthy and exotic jewel-tones of a Moroccan color palette - see camels, flowing scarves, tents, and Humphrey Bogart! An eclectic mix of natural turquoise, pumpkin gold, twilight purple and yellow glass beads, look perfect with copper findings and filigree beads. This month's bracelet features a medley of glass and a mix of African silver and gunmetal black. The blues are a play of African moveable rings and tubes and the Hyacinth orange provides a nice kick of color along with the African yellow white hearts. A gunmetal toggle finishes off this eight inch bracelet. July's eight-inch bracelet kit comes with all the beautiful beads you see here! It also comes complete with a pattern, clasp, crimps, wire, and a fun ready made dangle. July's bracelet complements a summer tan and features lovely agate stones, brass components, glass drops, cream colored discs, and seed beads. This fun bracelet is inspired by all of the amazing African beads that we have here at Beadhive. It features bright yellow recycled African glass and unique black African beads with red and white flowers. Coral African beads and blue glass add MORE color and texture. Pewter swirls and daisy spacers complete June's Bracelet of the Month Kit. This months bracelet takes a cue from the ocean with lovely greens and blues with gold accents, such as the sea shell charm by the clasp. It is made of Czech glass, glass crackle beads, freshwater pearls, and clear Chinese crystal. It plays with multi-metals with silver and gold findings. This happy bracelet kit is bursting with wonderful, bright Spring colors! This eight inch beauty features green stone magnesite, tangerine Czech glass, turquoise Swarovski crystals, fruit inspired pewter silver, clear blue Chinese crystals, and flat pewter silver discs. It finishes off with a pewter toggle and a Mother of Pearl flower charm. The kit has the pattern, beads, wire, and crimps. Prepare for Spring with this lovely bracelet of the month from Beadhive! This bracelet features tree branch and flower pewter beads, crystals in various colors, silver rondells spacers, Czech glass, and beautiful blue Lapis. You finish off your piece with a ready made dangle and a fun large spring ring clasp. This kit contains the pattern you see here, wire, crimps, and all beads needed to make an eight inch bracelet. February's Bracelet of the Month is a Sweet bracelet you can wear any time of year. Lime jade and peachy-pink adventurine stones are joined together with copper caps and beads, and smokey quartz glass. January's bracelet has loads of fun texture! Three charms dangle with brass and pink glass. The bracelet also features Swarovski crystals and strawberry quartz, black glass leaves, and gunmetal beads and findings. The kit contains all it needs to make an eight inch bracelet. It includes the pattern, wire, all beads, crimps, and clasp. All this for only $9.50! November's bracelet is a striking blend of turquoise Swarovski crystals, beautiful rich Lapis stone, Czech glass, and silver pewter beads, and a pewter toggle. This 8 inch bracelet kit comes with a pattern design, all the beads, wire, crimps, and clasp - all for $9.40! October's bracelet is perfect for a lovely Fall day or any night out on the town! This bracelet has it all with lemon jade, bright red horn spacers, blue faceted glass, swarovski crystals, and lots of great brass. It also has a fun matching dangle hanging from the clasp which is pre-made and included in the kit. The whole kit is only $7.85. 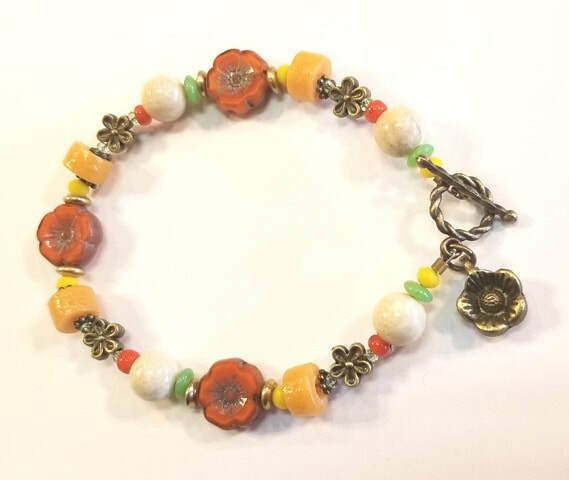 July's bracelet features a pattern of bright Summer green glass flowers, Yellow Jade, sparkly faceted brown glass, and shining pewter silver beads with flower designs. The bracelet is rounded off with creamy bone spacers and a great pinky-orange coral color featured in the African glass and Swarovski crystals. This whole kit, including wire and crimps, is only $8.70! Soft summer colors in African glass rings, Jade, Czech fringe beads, and Swarovski crystals make a pretty statement in Beadhive's June Bracelet of the Month. Pewter beads and disks give it a little edge. Step into Spring with Beadhive's May bracelet! This bracelet features some of our new pewter silver beads, pewter toggle, Swarovski crystals, moonglow opal glass, and beautiful pink agate stone. The kit includes pattern instruction, all beads, wire, and crimps for only $9.50! Additional beads are available in singles. April's bracelet of the month is a mellow assortment of colors... emerging blades of grass and spring's first daffodils under clear skies. This kit is only $9.65! Amethyst, Swarovski crystals and Czech glass comprise Beadhive's semi St. Patrick's Day Bracelet of the Month. February Bracelet: This months bracelet featured Czech Glass, Silver Plate Metal, Blue Firepolish, Frosted Blue Glass Beads, and a ready made Czech Glass and Silver dangle. Only $7.00 for the kit. January's bracelet includes new Czech glass, new African beads, eye-catching silver, and a silver button clasp.